Need extra space? This three bedroom / three bathroom corner condo is perfect for you! 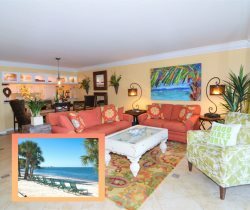 It offers an expanded, screened-in balcony with views overlooking the swimming pool and marina. Great location for viewing family and friends while sunbathing at the pool. The condo has undergone kitchen upgrades with the master bathroom upgraded Fall of 2017. The master bedroom has a king bed, the second bedroom has one twin bed and one full size bed while the third bedroom has a bunk bed with a full size bed on the bottom level and a twin on the top level. A sofa sleeper in the living room. Sleeps 8 people. Property was great. In the future we would prefer unit on longer stretch of beach but other than that stay was great!